As the month of February comes to a close, I take this opportunity to thank each of you for your support over these last few weeks as we celebrated Black History Month. Between our parish celebration two weeks ago, and the Diocesan Mass of Thanksgiving last week, we have joyfully commemorated the memory of our ancestors and have given witness to the bright future we have as a community of believers. How fitting it is to conclude Black History month with the gospel passage that we hear at Mass today. The Lord challenges us to love our enemies. It’s one of the most difficult aspects to Christianity, to love those who persecute us, to love those who have hurt us either physically or spiritually. The Lord also gives us what is popularly known as the “golden rule”, which is do unto others as you would have them do unto you. We must never forget or suppress the wrong or mistreatment that was done to the Black community in the past, but Christ the Lord calls us to embrace and love those who we find it difficult to love. Each of us are invited to truly take to heart the words of Christ today, to love our enemies and do good to them. Our annual parish art/photo exhibit will take place the weekend of March 2nd/3rd at the Waldorf School at St. Peter Claver. Those of you who wish to have your artwork or photos to be placed on display, please see the flyers that are available at each of the three churches. Youth between the ages of 5 and 18 are invited to submit their work to be entered into a contest. It can be art, photography or written (poetry or short story). The theme must reflect the legacy of St. Josephine Bakhita, an African slave who became a saint of the church. For more information please consult the flyers at each of the churches. We will begin the solemn season of Lent in just two short weeks beginning with Ash Wednesday on March 6. Please see the bulletin for the Ash Wednesday schedule of Masses and Liturgy of the Word Prayer Services. During the Friday’s of Lent we will also pray the stations of the cross at each of the three churches beginning at 7:00PM. In addition, we will pray solemn Vespers (Evening Prayer) on the Tuesday’s of Lent with a guest preacher. All are invited to pray with our parish community as we prepare to celebrate the Passion, Death and Resurrection of our Lord and Savior, Jesus Christ. What a beautiful celebration we had last week commemorating Black History Month! Almost 200 people gathered at Holy Rosary Church to first and foremost give honor, glory and praise to God and then to joyfully celebrate Black History. It was truly a joyful and prayerful celebration! Father Anthony Bozeman, who served as the celebrant and homilist for the Mass was absolutely phenomenal! He was very happy to spend the weekend with us here in Brooklyn and he promises to come back. I once again thank the Black History Month Committee for all of their hard work and dedication into making last Sunday’s celebration as beautiful as it was. We have much to be grateful for here at St. Martin dePorres, it is my prayer that the Lord will continue to bestow his abundant blessings upon our parish community as we bring the Good News of Jesus Christ to all of God’s people. As you all know, in addition to being the Pastor here at St. Martin dePorres, I also serve as diocesan director of ministry to African-American Catholics and the Vicariate for Black Catholic Concerns. Each year we sponsor our diocesan celebration for Black History Month with a Mass of Thanksgiving. This year’s Mass will take place today Sunday, February 17, 2019 at the Immaculate Conception Center in Douglaston beginning at 4:00PM. This year’s homilist will be Father Tony Ricard, a priest from the Archdiocese of New Orleans. He is gifted and talented preacher! There will be a reception to follow the Mass. All are invited. You will find in this week’s bulletin an insert regarding our regional Catholic school, St. Francis of Assisi Catholic Academy. St. Francis of Assisi Catholic Academy has begun the process of registering new students for the upcoming academic year 2019. Scholarships are available for families who wish to place their child into a Catholic school. Tours of the school and information about tuition and academics can be arranged with the principal and faculty. Please see the insert for more information and you may visit the school website. 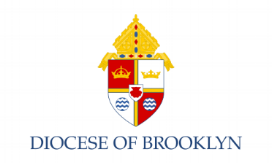 This past Friday the Diocese of Brooklyn released the names of 107 priests who have been credibly accused of sexual misconduct with a minor. These allegations date back as far as 1934. The majority of these priests are deceased. Those who are living have either been laicized or permanently removed from active ministry. The names have been published to offer greater transparency and accountability to the Church at large as well as to the general public. In this way, we hope to promote healing and justice. Let us continue to pray for victims and those affected by abuse of a member of the clergy. This Monday, February 18 is President’s Day. It is a national holiday. The parish office will be closed and only the 8:00AM Mass at OLV will be celebrated. There will be no Noon Mass at SPC.